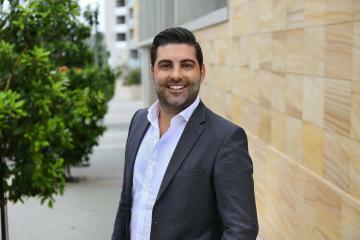 As Principal at Domain Property Agents, Ross Mournehis leads a dynamic team that is focused on developing a premium brand of real estate. Canvassing the needs of his Inner West clients for 15 years, Ross has continued to demonstrate his expertise through his solid negotiating skills and exceptional results. His leadership at Domain Property Agency is characterised by his impressive attitude and industrious approach towards his services. Ross's professionalism is most prominent in his relationship with people, realising that to listen, observe and engage with the needs of his clients, is the foundational value that underpins the culture of his Marrickville office. His well-established investment portfolio is a direct result of his visionary approach of connecting lifestyle with property and investment. Ross's redefining approach towards real estate allows him, as Principal, to offer his clients, the most attractive and premium choice in both office service and process. Renowned for his personable approach, Ross believes that success is a direct result of management and action. His confidence and unparalleled knowledge of the Inner West market has continually made him a popular choice for clients and that is why he believes that a "Referral is the best compliment." An outstanding opportunity exists to purchase 4 properties in one line for the purpose of potential redevelopment (STCA). This boutique site is situated on approx. 2200sqm of land and is ideally located a short walk to local shops, Carrs Bush Park and the sparkling waters of Kogarah Bay. Don’t miss the chance to secure this prime parcel of land and enjoy the current investment potential on offer. Zoning: R3 Medium Density Residential. FSR: 1:1.5. Height: 15 Meters. Land Size: Approx 2230 sqm. Spacious and vibrant office suites located in the heart of Marrickville. Ready to go and fully furnished with desks and office chairs. Available as single desk hire or entire suites of up to 6 desks. Up to 65 sqm available. Cleaning & utilities covered. All arrangements including length of stay and pricing are up for negotiation. Offering flexibility and convenience for all your business needs. Perfect for any organisation whether freelancer or existing company. Move in tomorrow! Perfect Space With Real Lane Access! This spacious shopfront is available in a prime location. Located on the busy retail strip of Wardell Road with a bus stop outside the front door, 100m from Dulwich Hill Train Station and Light Rail with high exposure to pedestrians and drivers passing by. Call Ross Mournehis on 0419 171 469 to discuss the opportunities and arrange a viewing. Domain Property Agents does not warrant or accept any liability in relation to the quality, operability or accuracy of this material. This huge shopfront occupying two street frontages and with more than 6 meters on each side whilst occupying approx. 200 sqm internally. Located on the busy retail strip of Marrickville Road it offers all the transport and foot traffic you would need. With a bus stop outside the front door, 700m from Marrickville Train Station and with high exposure to pedestrians and drivers passing by. - 200sqm approx. ground floor space. - Prime position on busy retail strip. - High Exposure. - B2 Zoning. DEVELOPMENT SITE WITH GREAT INCOME! Brand new 3 Bedroom apartment with great location within walking distance to Wolli creek or Arncliffe train stations, schools, shops , cafes, 15 minutes driving to Sydney Airport and the CBD. It offers a generous well-appointed floor plan in a super convenient location. Brand new apartment with great location within walking distance to Wolli creek or Arncliffe train stations, schools, shops , cafes, 15 minutes driving to Sydney Airport and the CBD. It offers a generous well-appointed floor plan in a super convenient location. This well presented 2 bedroom apartment is located in a small complex with a short walk to cafe's, shops and railway station, offering a unique urban Arncliffe lifestyle. Close proximity to the city and the train station on your doorstep can get you there in 12 minutes.